Rich, dark, sinful chocolate. But for me, that’s not enough. I needed more. As if chocolate wasn’t enough. Hey, why not add peanut butter, with a sprinkling of maldon. There, now that is one sinfully satisfying dessert that will embrace all cravings for decadence. It’s Valentine’s Day. 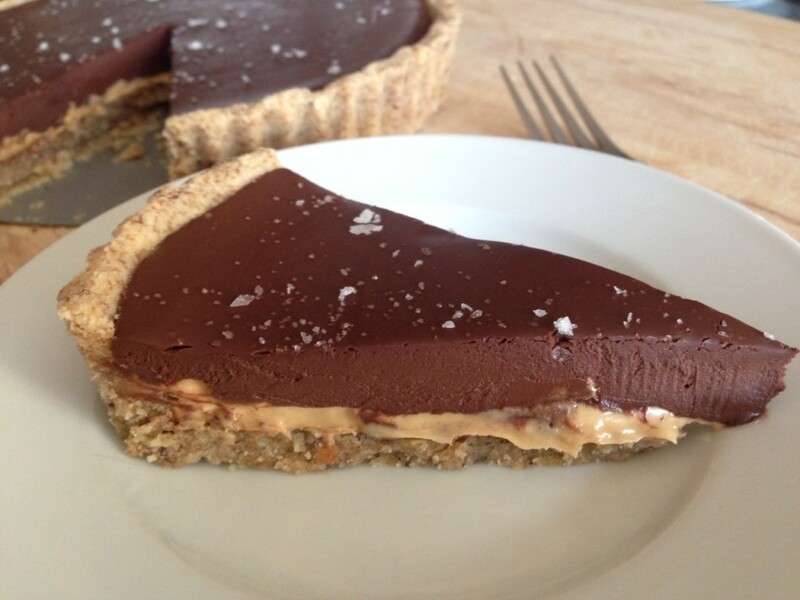 This sweet, yet salty, crunchy, yet creamy chocolate tart will have your partner weak at the knees. Now is the perfect time for any bribery. It’s that good. This tart does have a few processes to it, but worth fussing over in the kitchen. As with most of my recipes, each component can be made a day or two in advance. 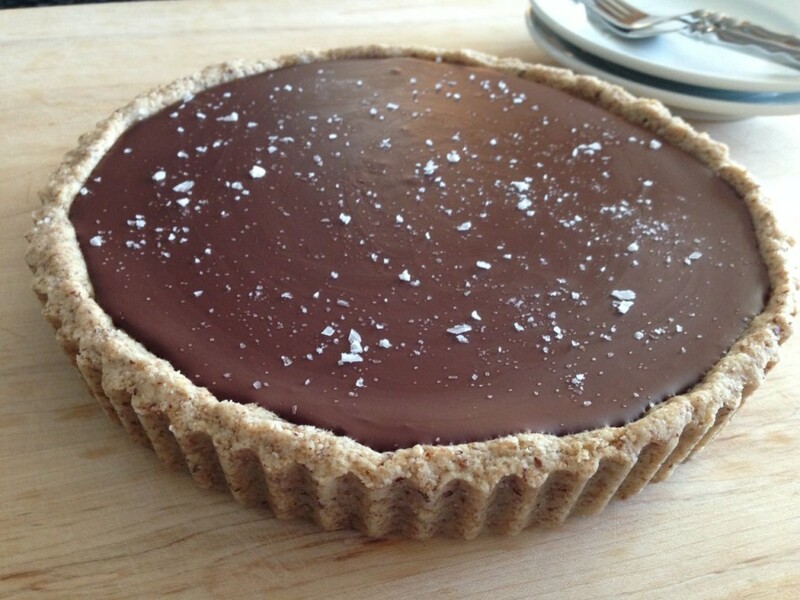 For those that haven’t made a tart before, no problem! This tart does not require any savvy baking skills. No rolling dough techniques here. I have been packing up my house, with boxes everywhere, the past few months (moving day is less than 2 weeks away! ), AND planning an April Bar-Mitzvah 3,000 miles away leaving me a teeny bit of time to post this recipe to my fabulous viewers. It has been crazy busy around here juggling life. But I had to take a moment to put down the packing tape to make this tart again (it’s been a while) when I went through my recipe book. It is worth every detail, down to the sprinkling of maldon sea salt, because when it all comes together it is just heavenly. In a stand mixer fitted with a paddle attachment, mix flour, ground almonds, and brown sugar on medium speed until well blended. Add the pieces of earth balance, raise speed to medium high. 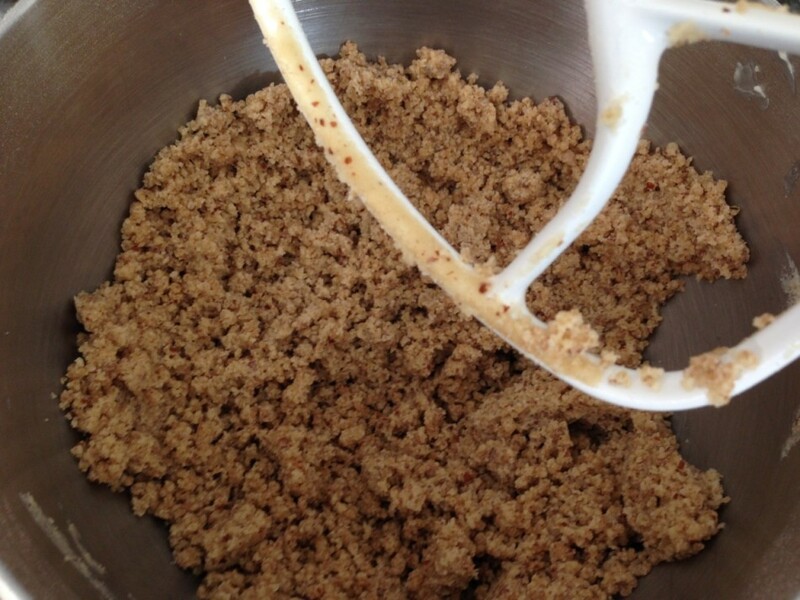 Continue mixing until mixture appears crumbly. 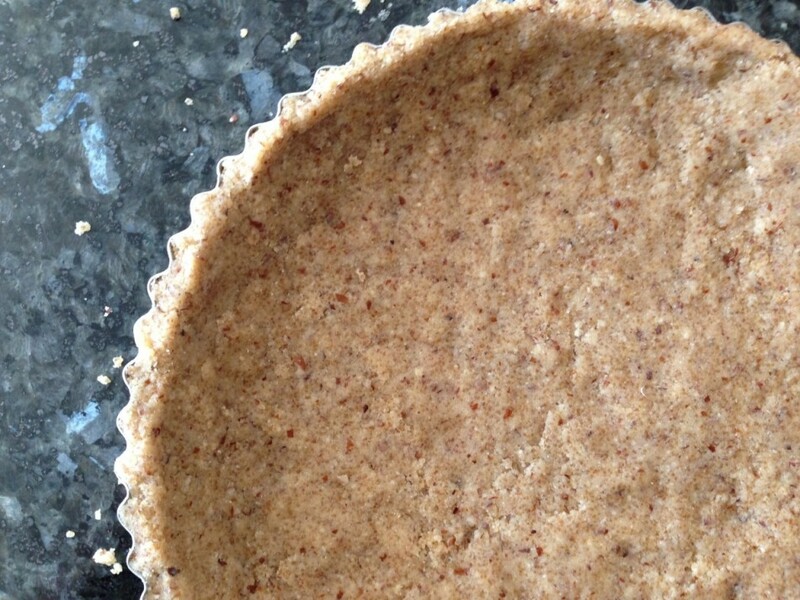 Put fistfuls of the crust mixture into your tart shell (no greasing needed) for the bottom. Press down the bottom, making sure you don’t have any uncovered areas, about a 1/4 inch thick. 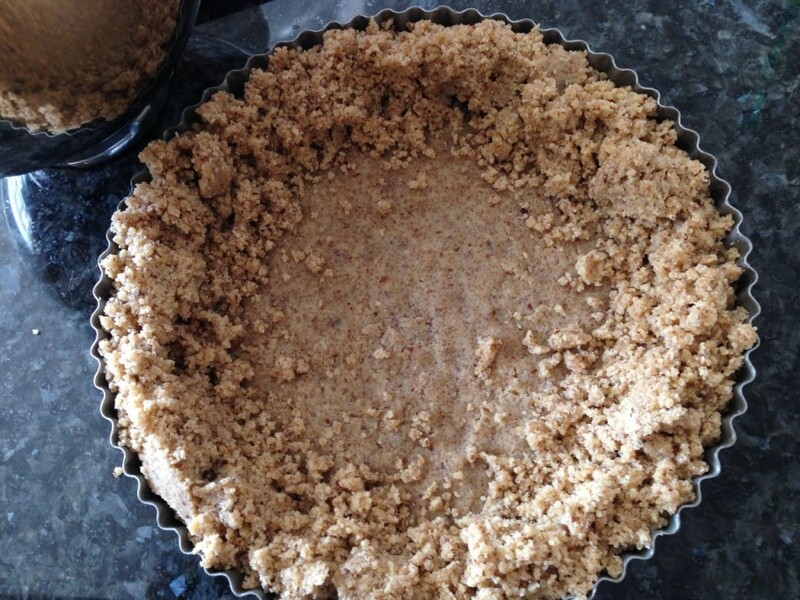 Loosely add the remaining crust mixture all around the tart (see picture below). I do it this way rather than the press-as-you-go method to make sure my crust is even all around. I used to do the press-as-you-go in the past and found that some areas would be thicker than others because I took too much mixture at first. I do the same for pie crusts. Makes crust making go quickly. We like quickly, don’t we? Use the back of a 1/4 cup dry measuring spoon to press mixture into the edges of the tart shell for a nicely shaped crust. Now it’s ready for the oven. Bake for 8-10 minutes. Let it cool in the pan for 20-30 minutes. While cooling prepare peanut butter filling. Combine the sifted peanut butter, and powdered sugar in a stand mixer and start mixing on low speed (so that you don’t have powdered sugar everywhere), then raise to medium high speed. Continue mixing for a minute then add the earth balance and sunflower oil. Mix until well blended. Scape down the sides and bottom of the bowl to ensure even mixing. 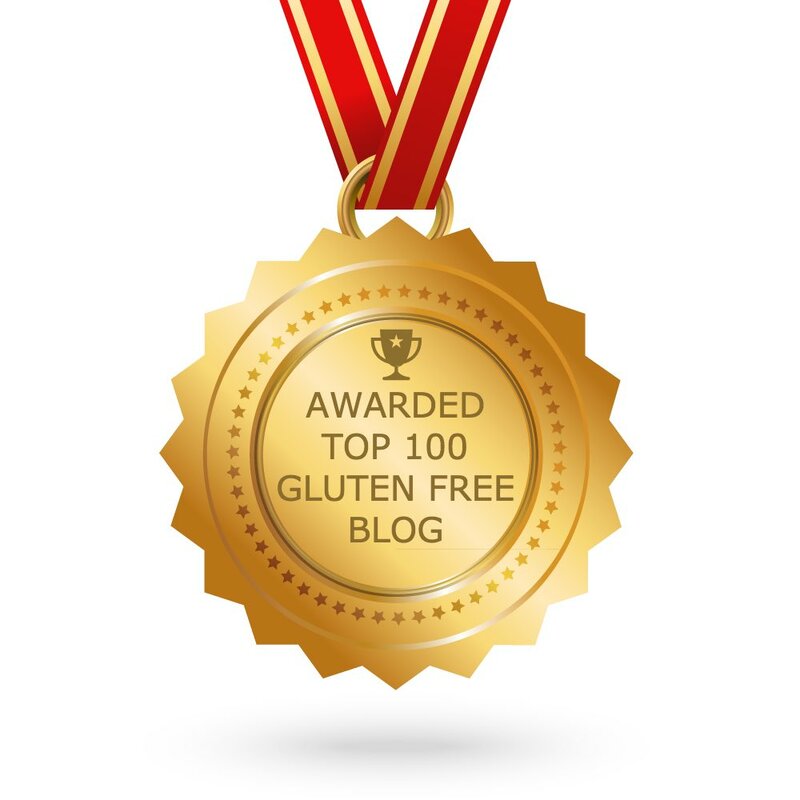 Sometimes you get a hidden clump of an ingredient sitting right at the bottom of the bowl. The consistency of the peanut butter filling will look like a watered-down frosting. I spread it easily with a small off-set spatula (the kind used for frosting cupcakes). This concoction has definitely been noted as a base for a killer peanut butter frosting. Wow. 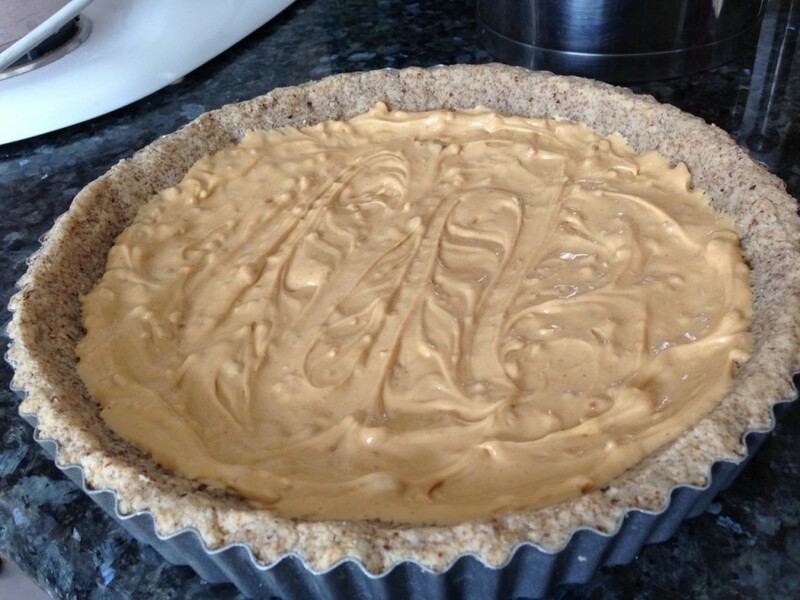 Once your shell has cooled, fill with the peanut butter filling. Then refrigerate for 30 minutes. Pour the coconut milk into a small heavy-bottomed stainless steel saucepan set over medium heat. Heat the milk until just scalded, about 3 minutes. Watch it carefully, you do not want it to boil. Turn it off just as you see little tiny bubbles forming all around the edges of the saucepan and the liquid in the middle looks like it’s about to lift up into a boil. Take it off the heat and add your chopped chocolate. Do not stir! Let the chocolate sit in the hot coconut milk for a few minutes to get that nice consistency of a ganache. 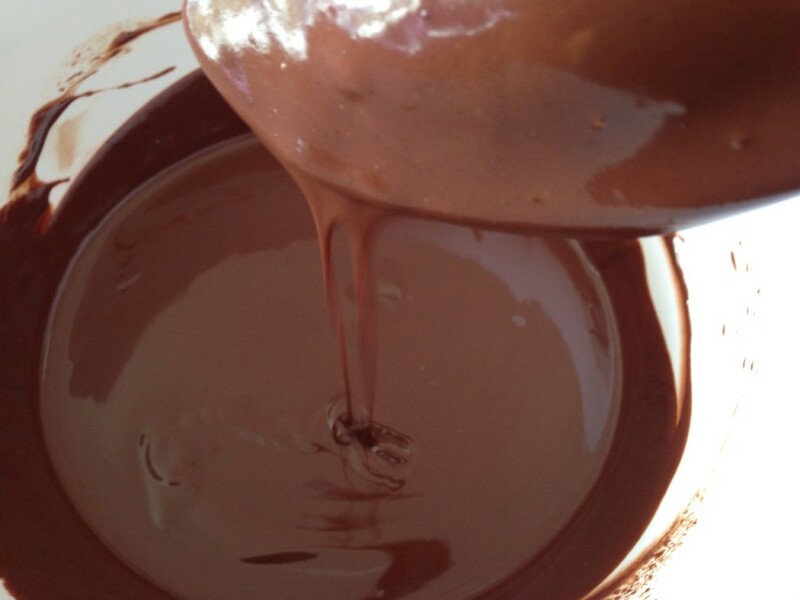 Stir the chocolate into the coconut milk using a rubber spatula or wooden spoon. The ganache will be thick, yet pourable. 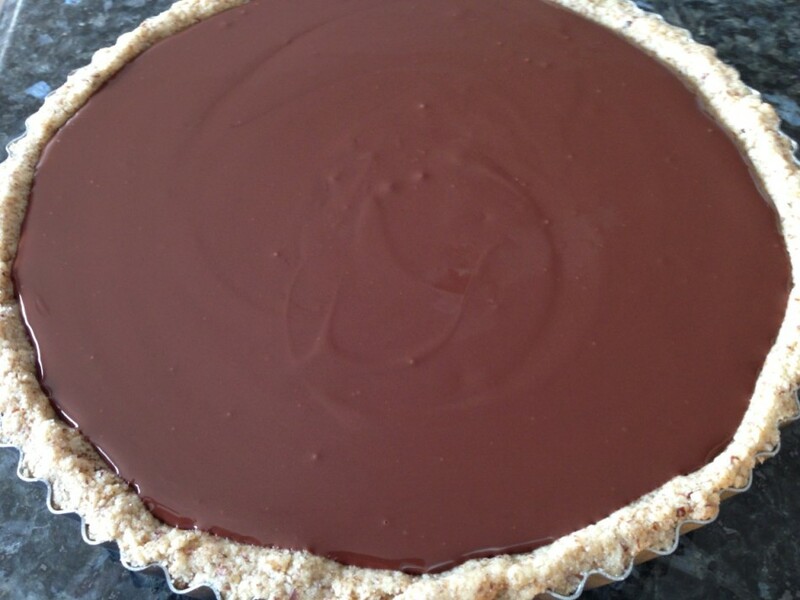 Pour that gorgeous melted chocolate into the tart. And wait one hour. I know, but we need to wait for this beautiful thing to come together before we do some serious indulging. Don’t chill during the wait time, otherwise, the Maldon sea salt won’t adhere to the chocolate. Sprinkle Maldon on top before serving. Serve chilled. This looks so rich. I love the photos and all that chocolate! So once the shell is cooled I should make the ganache? Or is that a waste of time? How long until the shell is cooled, usually? You can make the ganache while your crust is cooling. The crust usually takes 30 minutes to cool before filling. Enjoy! 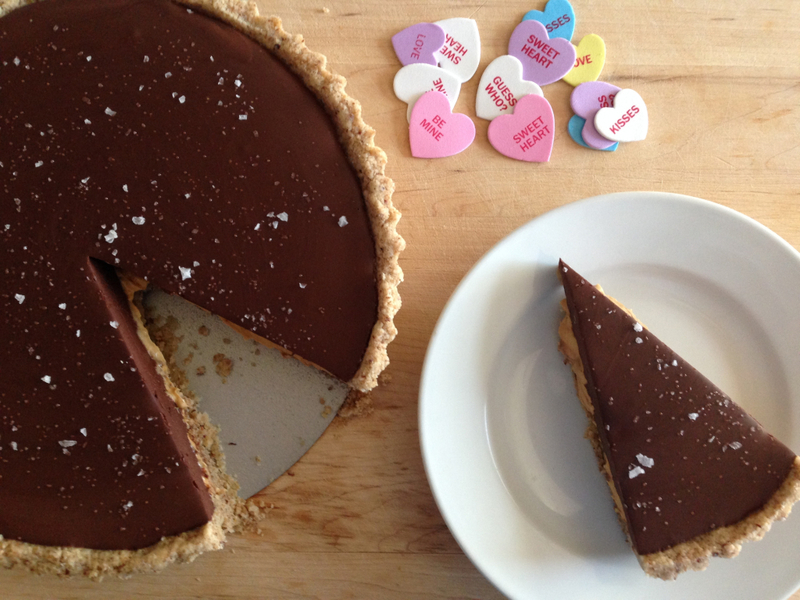 I want to make this tomorrow for Valentine's Day but want to clarify the last step about the ganache setting: have it sit on the counter for an hour before adding sea salt? Can I chill it then add sea salt? My dog may jump up to the counter and grab it. I was thinking to omit the sea salt but am curious how it will taste..thanks. Your recipe looked to-die for on Pinterest and when I saw it's gf & df I had to try it. My Son cannot eat peanuts so I used almond butter instead and it had the flavor of a Hershey's almond bar, it was delicious!! We all were sad when it was gone. That's how I feel Stephanie, I'm with ya. So happy to hear that you made it work around his allergies and that you all enjoyed it!